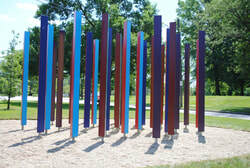 “Colorfield” was commissioned by the Ludlow Community Association to celebrate and honor the historic Ludlow Community. With installations in both Shaker Heights and Cleveland sites, the sculpture symbolizes this unique neighborhood that spans two cities. Constructed of painted metal pythons, the colors change as you move around the sculpture – a tribute to the diverse residents of this strong and civically active neighborhood.